Here are some of the hundreds of questions you have sent to Chef-Menus.com. 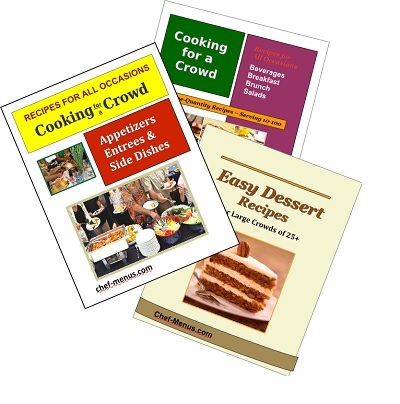 You may find answers to your own cooking for a crowd questions. I am having pulled chicken for my baby shower. I'm feeding approximately 55 people and would like to know how much boneless chicken breast to get? Help please! This event approaching very soon. All of this makes it difficult to give an exact number of pounds but I hope it gives you a place to start. Congratulations....please let me know how it turns out! Thanks for your question. I don't go by weight but by servings per person. First decide how many sausage and pepper sandwiches each person will eat. if you decide each person will eat 2 sandwiches and if there is one sausage per sandwich that would be 100 sausages. How many sandwiches each person will eat depends on what else is being served, the size of the sausage/sandwich and how hungry the buddies are. Hope this answers your question! We are catering a plated 3 course dinner for 200 people. We're planning chicken cordon Bleu, rice pilaf and a veggie for entree; mixed greensalad with cranberries, feta cheese and walnuts with a light balsamic vinegrette; dessert???. The kitchen at the hall has 1 household fridge and two﻿ electric kitchen stoves with ovens.What should we serve for veggies and how should we garnish or decorate plate? What should we serve for dessert? What about bread? proper temperatures and in a timely and professional manner. for such a large group with the restrictions of the facility and helpers. Scared silly!!! First off, relax. It will be a tremendous success because of your determination, failure is not an option! person put the greens on the plate, the next person follows with the cranberries, then feta etc. Put the dressing on each table for self-serve. Do the chicken, rice and veg the same way, put the chicken on each plate first. Realistically and depending on the number of volunteers, you will only get a certain number of people served at one time. Everyone will not be eating at the same time. I know this is a special meal but you may consider serving buffet style. I have been to fancy affairs served buffet style and it can be lovely. Buffet style solves the space and plating issues and you can have the volunteers do the serving from the chafing dishes. Buy, borrow or rent the nicest chafing dishes you can afford. Hope this helps a little. I am chairing an event for our hospital auxiliary and plan to serve ground beef barbeque (sloppy Joes or steamers depending on where you're from) to 75 people. How much ground beef should I use? I am hosting a surprise 60th birthday for my husband. I found your website and your recipes are what I had in mind for quantity cooking. I anticipate 50-60 guests. I am serving 3 appetizers: Pesto Crostini, Stuffed Mushrooms with Spinach and Blue Cheese and assorted nuts. Dessert: Chocolate Cake, Vanilla Bean Ice Cream and Petit Chocolate. My questions: Your meatball recipe makes 100, 2 oz meatballs, will 3 meatballs per plate. Along with 1+cup of baked ziti, will that be enough? I realize the meatballs are under your appetizer menu, but will they work as the entree? Thank you for your time. What about the amounts or recipe for scalloped potatoes and ham? On the Internet I got recipes for 100 that varied from 30 to 44 lbs of potatoes, sliced. That's a big difference. I took Corn and Tomato Scallop for 100 and figured I could just omit the tomatoes and do everything else the way it was written. Thank you for your help - I really appreciate your time and effort - hope you are having a good Easter season and Spring comes soon for you. You are welcome. I am also waiting for spring, although winter here in the North East has not been too bad. Yes, I have noticed the differences in recipes also. A good rule of thumb I use for potato dishes is 1 small to medium-sized potato per person. Check how many potatoes are in a sack and go from there. I would suggest using Yukon Gold or white potatoes because they will hold their shape better then Russet/Idaho pots. For the diced ham, I would say about 10-12 pounds would be plenty. people. We will have stuffing, mashed potatoes and yams, among other things. I am assuming that I do not need 350 servings of each starch but what would be an acceptable amount to plan for? A speedy response would be greatly appreciated!!! Thanks for visiting Chef-Menus.com. Kudos to you for cooking for 350! Usually I do not recommend making the exact number of servings for each and every dish. But on Thanksgiving, people will eat starch upon starch and not worry about the carbohydrate overload! of what people eat most on T-Day and a "guesstimation" of your crowd. I am cooking at my church this Friday and need some help. I am the chef for the annual mother/daughter dinner. I will be serving approx. 100 guests. I will be making roast pork, scalloped potatoes, salad, appetizers, dessert, rolls, and beverage. I will be purchasing the food in bulk at Costco. I figure 35lb of uncooked boneless pork roast, 40 pounds of scalloped potatoes, 2-3 pieces of apps. and dessert per person and several gallons of lemonade and ice tea. Coffee and water will be served also. It also depends on the ovens; do they maintain the true temperature? Meaning, if the temperature knob is at 350F, is the oven temperature 350F. If you or no one else knows, you could use an oven thermometer and test it before Fri. I think it's worth it. Using a food thermometer is always the best way to know when food is done, start checking about 10 minutes before you think it should be done (pork=145F) Finally, my favorite tip, let the meat sit at room temperature about 60 minutes before you cook, that assures an even start and will prevent uneven cooking. Hi, You helped me in the past so I thought I would contact you again. I was cooking pork roast for 100 ladies at my church and you gave me some good advice. I am having a fundraiser Oktoberfest at the church. Looks like we could have over 250 people attend! I am making brats, pork roast, 1/4 chickens, sour kraut, sweet sour cabbage, and dumplings. How much sour kraut and sweet sour cabbage should I make? Also, do you have any good recipes? Wanna come and help! Yes, I remember you and your pork roasts question! I assume everything went well since you are willing to give the porkers another try! First I would determine how much your crowd loves cabbage! Then, if you are serving two types of cabbage, I would do half and half. You would need about 20 pounds of fresh cabbage for 100 servings of the sweet and sour and about 10 quarts of canned sauerkraut for 100 servings (assuming about 1/2 cup of each cabbage and assuming that not all 250 persons will eat either cabbage dish). Of course you could bump these numbers up to serve more. But whoa.....if you are making homemade sauerkraut..I guess you know you will need a whole lot more cabbage...good luck with that! Actually, I don't have any good related recipes, but I was thinking that either adding apples to the sweet/sour cabbage or a side dish of cooked apples with orange zest and nutmeg would be a nice addition to the brats and pork....also very "fallish"
Hello Chef! I am making a traditional Jewish Passover meal for approx. 130 people. There still could be more to come so I thought I should plan on 150 - Thoughts on that? Should I do 150 servings of everything or should I go with the 130 x 1.5 servings = 195 servings of everything? I'm planning on a simple tossed salad, chicken soup, beef brisket and roast chicken - how much of each? A Matzah stuffing and roasted potatoes and onions - again - how much of each their special carrots called Carrot Tzimmes. I do have a recipe for a large quantity that serves 48 and I thought about doing another vegetable - again how much of each vegetable. I've served for large crowds before but I'm a little concerned since I've never done this type of meal for so many. It is a buffet style. Can you give me any input or is there a formula? Do you figure a serving per person or figure on more people and a serving for each just more or how do you figure. Thanks for your help. Thanks for visiting Chef-Menus.com where your questions are always welcome. Whew! 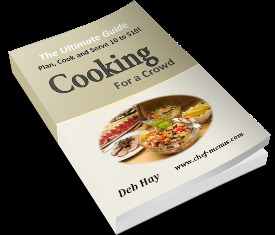 If you've done cooking for a crowd before, you probably have a few tricks up your sleeve....don't worry, you'll be fine! If you are sure of the 20 extra guests and your budget allows for it, planning for 150 sounds right. Do you have an idea of the overall appetite of your crowd? Are they mostly young men, older women, children, teenagers, "weight watchers" or vegetarians? 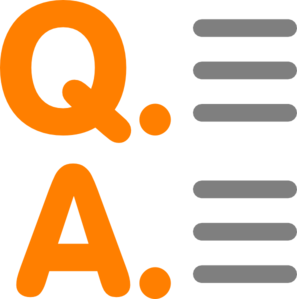 Answers to those types of questions determine how many servings to prepare. Because of this, there is no formula, just good "guesstimating"
If you have 10 different dishes, for example, not all 130 people will eat a full serving of each one of the 10 dishes. Mostly folks like to "graze" and take a small sampling of what they like. So, 195+ servings of everything may be too much. Thanks for visiting Chef-Menus.com, your patronage is definitely appreciated! What a good idea! A burrito bar is fun and relatively easier then a plated dinner (fingers crossed here). I am assuming you are using ground pork and it will be mostly adults. I would suggest 28-32 pounds of pork, which will yield about 1/2 cup cooked meat per burrito and is a generous amount especially if you have other fixins' (rice, beans, cheese, etc). With that in mind you could cut the pork to about 22-25 pounds which will yield about 1/3 cup per serving. If you need help with the fixins' amounts please consult the food quantities chart or shoot me another email. Hope this helps. I am cooking for 100 people. How much pasta and sauce do i need? Well, it probably depends on the type of sauce you are planning, but as a place to start, I would say you would need about 4-5 gallons of sauce and about 10 pounds of dry pasta. wings to accompany these dishes and I am wondering how many wings I should do. Help? Thank you for any suggestions. Yumm-ee! I love Mediterranean and all Pacific style cuisine....wish I could be there! Well, I did it. I had 53 people. I did 65 boneless skinless chicken thigh filets - lemon roasted. 4 kg Greek roasted potatoes. I did 80 wings. I had to stop there with the meat as I was out of oven and crock pot space. The tsatziki dip was a hit. I had one big pan of Nasi and one big pan of bami - I could have had more of both of these. It seemed everyone ate till they were satisfied and I did not have much left over so it worked out good. Thanks for your help. One suggestion you didn't ask for, for the Chick Cacc, use diced boneless thighs. It's difficult to eat bone-in chicken and remain calm, cool and clean in front of co-workers and the boss. Hope this helps you. Have a wonderful holiday! I am doing a church dinner for 400. I would like to serve herb roasted potatoes. I was going to par boil them and then put them in oil, garlic, basil, on large trays in the oven. My question is how long would you cook them in the oven, not to be over done. I would have to do them in batches like one large pan (the size almost of the oven shelf) one pan on each shelf in the oven. Thank you for any help you can give me. I appreciate your patronage. Whoa! Potatoes for 400...let me know how it turns out! The parboiling is normally a good idea but I would think that for such a large amount, the time it would take you to parboil and drain/dry the potatoes would take the same or even more time then roasting them raw. Plus, I'm a firm believer in eliminating extra steps. Cooking time depends on the oven of course. I assume this is the church’s commercial oven? If you’ve never used it before, I would suggest doing a trial run with an oven thermometer to test the “true” temperature. Otherwise, I would say the cooking time would be only slightly longer then in smaller batches, For raw potatoes: 40-50 mins at 375-400 degrees. For parboiled, 25-35 mins at the same temp. How to use your favorite 10 serving recipe to feed 100!